Researchers: Giorgio Savastano, Augusto Mazzoni, and Mattia Crespi, University of Rome “La Sapienza”; Attila Komjathy, Olga Verkhoglyadova, and Anthony J. Mannucci, Jet Propulsion Laboratory, Caltech; and Yong Wei, NOAA and University of Washington. A new method to compute total electron content (TEC) in the ionosphere to measure perturbations caused by tsunami waves has been shown to work retrospectively for tracking tsunami waves around Hawaii from the 2012 Haida Gwaii, British Columbia M7.8 earthquake. 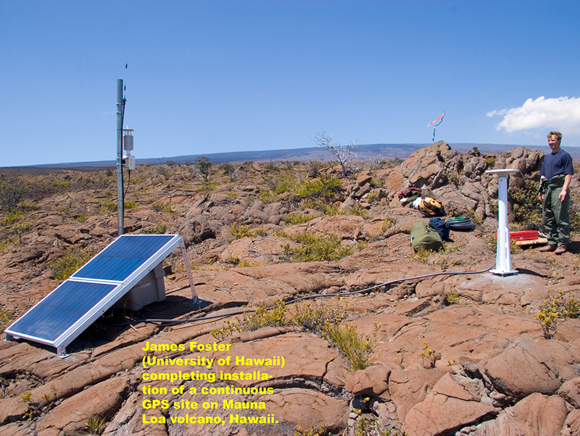 The method relies on ground-based GPS stations on the big island of Hawaii that sense the density changes of the electrons in the ionosphere as the signals travel from the satellites to the receivers. This approach may help provide real-time information for tsunami early warning for future events, especially for Hawaii and other islands isolated within large ocean basins. Tsunamis can generate gravity waves that propagate up into the ionosphere and change the electron density, creating traveling ionospheric disturbances (TIDs) that move with the tsunami waves. These TIDs can be measured with the Global Navigation Satellite System (GNSS) by determining the influence of the ionosphere on the satellite signals reaching ground-based receivers at GNSS sites. On the big island of Hawaii there are 56 GPS sites operated mostly by the U.S. Geological Survey, with some sites operated by the International GNSS Service (IGS) and the Global Geodetic Network (GGN). Data streams from these sites are openly accessible from UNAVCO’s Data Archive. A new method, the Variometric Approach for Real-Time Ionosphere Observation (VARION), is tested for tracking changes in the ionosphere’s electron content caused by tsunami waves around Hawaii produced from the 2012 Haida Gwaii earthquake. VARION tracked TEC variations in the ionosphere of 0.25 TEC units after the earthquake; the TEC variations are similar to the time and space of the tsunami waves. The TIDs had a speed of 316 meters per second away from the earthquake epicenter. The TID periods are consistent with the tsunami waves’ deep ocean period. The results are consistent with NOAA’s real-time tsunami model and suggest the method could help with tsunami early warning as well as for understanding tsunami processes better. Savastano, G. et al. Real-Time Detection of Tsunami Ionospheric Disturbances with a Stand-Alone GNSS Receiver: A Preliminary Feasibility Demonstration. Sci. Rep. 7, 46607; (2017), doi:10.1038/srep46607.